This effectively sums up Céline Gormally’s philosophy when it comes to her small estate in the small town of Passenans, to the southwest of Arbois. She and her husband, Steve, began acquiring parcels in 2008, when they received 1.44ha in the Les Combes vineyard from La Foncière Terre de Liens, a group that promotes organic agriculture all across France (more information on that is available here: www.terredeliens.org/la-fonciere). 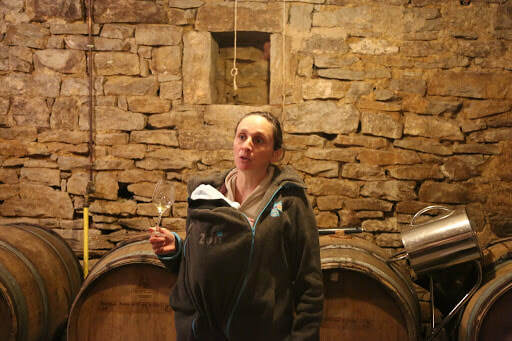 At the time, Céline was working with other estates in tandem with her fledgling operation, and it wasn’t until 2010 with the purchase of a few more parcels in Passenans and the nearby commune of Frontenay that they reached their current size of nearly 4ha and committed full-time to their own vines. Biodynamic treatments made by Céline and Steve are used regularly in the vines, and they are certified organic. All vineyard work is done by hand or with a small tractor, and they are in the process of training their mare, Octavia, to do the tillage as to cut back their need for all machinery. Soils are rocky, rich in marl, with a deep limestone base that lends intense minerality to their wines. Les Combes is a parcel that was planted in Passenans in the 1950s. Chardonnay, Savagnin, Trousseau, Pinot Noir, and Poulsard are grown here. En Rollion is a small parcel, about .2ha, also in Passenans, planted to Trousseau, Pinot Noir, and Gamay. En Rolion (yes, there is a difference) is one of their newer parcels in Frontenay which is only planted to Savagnin and Chardonnay. ​Les Boutonniers is about 2ha, with Chardonnay and Pinot Noir vines dating back to the 1950s. The big focus here is on terroir, so winemaking is incredibly straightforward to let the individual parcels truly express themselves. 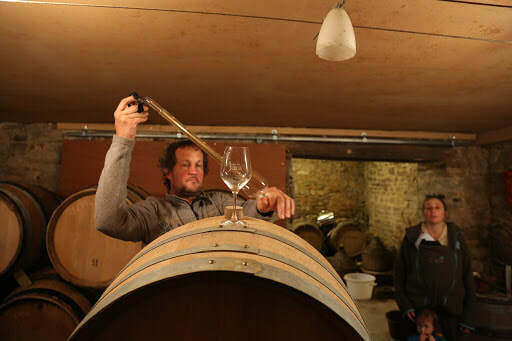 All wines are fermented with native yeasts and aged in neutral barriques, with very little sulfur added, if any. Tout Pete: A zippy, fresh pét nat made from Savagnin from a small parcel of vines at the bottom of the hill of Château-Chalon. It’s literally the first parcel outside of the AOC without actually getting it. Les Combes: Super bright and airy Chardonnay. Les Boutonnieres: Forward, dense, and woolly Chardonnay. En Novelin: Young-vine Chardonnay, very lean and mineral. Arco: Crystalline and mineral Savagnin. En Rolion: Also Savagnin, but with more density than Arco. Croix Serrant: Much more intense and electric Savagnin. La Cabane: Vivid and bright Pinot Noir. En Rollion: Trousseau, more serious and structured.